24/Seven: The Atlantic Antic is back! The granddaddy of all street fairs is back. 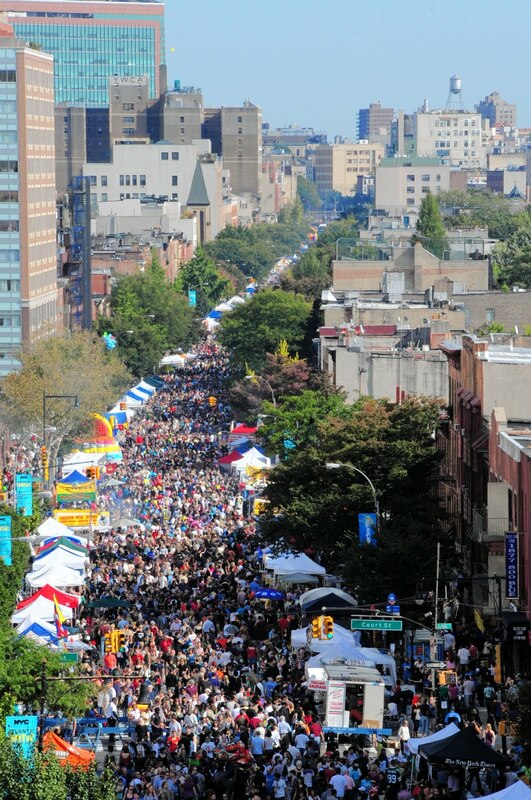 On Sunday, Sept. 26, the 1-1/2–mile stretch between Hicks Street and Fourth Avenue will host the 36th annual Atlantic Antic, featuring more than 600 food, art and shopping vendors, 14 performance stages and even kid-friendly activities like pony-rides and a magician showcase. ”The Antic is a New York institution that merchants and attendees anticipate year after year,” said Brooklyn Brewery owner Steve Hindy, who co-sponsors the event. We can’t wait to pair his beer with the festival’s food, especially Pete’s Waterfront Alehouse’s succulent pulled pork. This slammin’ cue dish even won the Grand Master Award at the Meatopia BBQ competition this past July. In addition to awesome food and drink, the Atlantic Antic has arranged for a slew of bands to rock the blocks. There’ll be Antic veterans like The Dysfunctional Family Jazz Band, who will play in front of the Brazen Head between Boerum Place and Court Street, as well as festival newcomers like The Windsor Terrors, a classic rock group. These Brooklyn-based old-timers, who met as school teachers way back in the 1970s, channel the British invasion-era bands that they grew up with. ”They’re not quite the Rolling Stones, but they’re pretty good,” said Jimmy Grimason, manager of the Chip Shop, where The Windsor Terrors will be taking the stage. Atlantic Antic [Atlantic Avenue between Hicks Street and Fourth Avenue, (718) 875-8993], Sept. 26, 10 am–6 pm. For info, visit www.atlanticave.org.